Five month old Zach sleeping through the night on his floor bed. My dear friend Pilar shares with us her experience and understanding of the “floor bed”. It seem to be such a controversial idea, yet when we think of it; isn’t the crib used more to comfort parents then for the freedom of visual exploration and the freedom of movement the floor bed offers the child? Read on and let me know your thoughts. My friends Andrew and Claudia are expecting their first baby. During a recent visit to their house, they asked me (based on my experiences with my son) what items I thought were essential for a baby and what things they should avoid buying. The floor bed, a low twin mattress placed directly on the floor of the child’s room, is a simple concept that stirs up complicated emotions in people. We’ve become so accustomed to the idea that a baby must sleep in a crib, that we struggle to envision any other alternatives. 1. Won’t my young baby roll out of the bed? 2. How do I get my crawling/walking baby to stay in bed? The answer to the first question is: Yes. Your baby will probably roll out of bed once or twice (as my son did), but since the mattress is low to the ground, he will be unharmed (you can place a folded blanket on the floor around the mattress to soften the fall, but most parents find that they don’t need it). What will your baby learn from his experience? He’ll figure out where the edge of the bed is and what it feels like. He’ll discover what happens when you go past that edge. He’ll understand how to control his body and reverse his trajectory when he realizes he’s reached the perimeter of the mattress. These lessons are extremely important for the child’s future safety and mental development, because he’s learning about cause and effect and forming an accurate perspective of his surroundings. When he begins to crawl and reaches a step, his experience with the edge of the bed will remind him to stop in his tracks. Many parents whose babies have slept on floor beds have stories of their budding crawlers scooting towards the stairs and stopping just shy of the edge, without adult intervention. The floor bed helps the child develop an accurate sense of “body scheme”: knowing where your body is in relation to your environment, and accurately gauging how much effort to put into your movements. A well-honed body scheme is essential throughout life to be successful in sports, the arts, most medical specialties, and many other activities. Now let’s consider the second question, getting baby to stay in bed. Won’t your crawling child be tempted to dash out of his room the moment you put him down on the floor bed? If there’s no crib to keep the baby contained, how will he ever nap? The crib offers the convenience of keeping the child contained while the parents are not around, but at what cost? Many children resist napping in their cribs: most parents have horror stories of babies throwing temper tantrums the moment they’re placed in their cribs, and we’ve all heard of agile babies who climb out (and fall and break bones) as soon as the parent walks out of the room. Do babies hate to nap, or is it that they hate to nap in a crib? The answer can be found by placing the child on a floor bed instead of confining him to a crib. On the floor bed, the child does not feel imprisoned, so naptime becomes a pleasurable experience instead of an imposition. The child feels like he’s in control of his life: if he wants to sleep, he can. If he’s not tired, he can get out of bed and play with the (two or three) toys that are available to him in his child-proofed room. Then, when he gets tired (which is bound to happen eventually), he’ll either fall asleep on the floor or return to his bed for a nap. Children should not be forced to sleep on a schedule that’s convenient for the parents; instead, we should follow their developmental needs. By creating a positive and nurturing bedroom environment, we are encouraging healthy sleep patterns that will benefit everyone in the long run! Imagine putting your baby on the floor bed, patting his back, walking out of the room and closing the door while he drifts off to sleep on his own. Doesn’t this sound better than the daily tantrums of a confined child? If you have a hard time believing that a ten-month old has the maturity to choose when to nap, you’re not alone. However, it might comfort you to know that for almost a century, parents who follow the Montessori approach have been using floor beds successfully, and have seen first-hand their children’s ability to regulate their own sleep patterns. The floor bed requires trust, understanding, commitment, and flexibility on the part of the adults. By setting up an environment that allows a child to make choices (albeit limited choices that are in his best interest), you are helping him to become more independent, mature, and self-assured. As a floor bed supporter, I highly recommend the twin mattress over a crib mattress. We did the crib mattress and boy does it make for a cramped situation for nursing the baby at bedtime or story time, and especially if you want to nap together. It also doesn’t help much as a guest bed option, unless you have guests under the age of five. It’s a good idea to flip the twin mattress every couple of weeks to release condensation that may occur underneath and let the mattress breathe. Thanks for your comment. Very good point Bug about the size of the mattress if you want to stay with the child. I’m loving our floor bed for our son who is 10 months. He is sleeping through the night. However he does wake up sometimes and cries a bit like very briefly then falls asleep again. Is that normal. He may have been teething during this time too. But I wanted to ask how early can you do a floor bed for a baby? Or what’s the best timeframe especially if a mommy nurses exclusively? Samantha, Thanks for contacting me. Your little one waking up in the night sounds perfectly normal, especially if he was teething, the nice thing is he soothed himself back to sleep. as for when to start a floor bed, I recommend from birth, at first using a small basket but placing it where the floor bed is. As for night feeding if you use a twin size mattress then feeding can happen there as well but not necessary. Hi. I appreciate your input of twin vs. crib mattress. I am just now exploring crib alternatives — cribs look like tiny prison cells. Rebecca, yes the crib is a very restrictive container, which is why I really encourage the floor bed from the beginning. The twin size versus crib size mattress is a space issue and comfort for the parent at first. The crib size is good for the first three years depending on the size of your child. The twin will last for a much longer time and is more comfortable if you need to lie down with your child. I have also created children’s sleeping arrangement with queen size mattress, so its really up to you. I’m glad you are looking into other alternative to using a crib since it really only last a very short amount of time, can be quite expensive and not optimal for your child’s development. Yeah, it is so brief. And just like many things, it seems a crib is more for the parents than it is for the baby/child. We’ve been going back & forth. Mother-in-law is so hooked on telling us “We want to buy the crib.” They’re quite traditional (they think we need to have a whole nursery set up — the only place we have for anything is our own bedrm. It’s a tiny house). My husband told her recently “we’ve decided to put off buying a crib” — since we’ll have the family bassinet & my family’s cradle. Dodged that issue for now. Just looking for some guidance as we want to start our 6 month old on a floor bed. Will any crib or twin mattress in the floor do? Currently we co-sleep and I’m not sure how to approach the transition. Would you thinking setting up the bed and laying with him until he falls asleep? Also, does it make sense to have it in our room first? Would be have to make some sort of gate or I guess that defeats the purpose. He rolls but isn’t super mobile yet. When is it safe to transition kids with floor beds into their own room? So many questions but I really want to do this safely and informed. Thanks a bunch! So glad you are looking into providing an environment conducive to your sons’ natural development. He is lucky to have you by his side. Will any crib or twin mattress in the floor do? YES, size is a personal choice. A twin size will last longer and give you the opportunity to lie down. Depending on your child’s size a crib mattress can usually at least 3 years. Currently we co-sleep and I’m not sure how to approach the transition. Would you thinking setting up the bed and laying with him until he falls asleep? Not necessarily, be careful of the routines you establish for these will be needed for a few years. Be mindful that you are creating a habit for the long run. You might want to start using his new floor bed for naps and then transition to nighttime. Also, does it make sense to have it in our room first? Again not necessarily but if you feel more comfortable why not. I would rather have it set up where it is going to be for years to come. Would be have to make some sort of gate or I guess that defeats the purpose. He rolls but isn’t super mobile yet. When is it safe to transition kids with floor beds into their own room? This again is personal and I strongly believe that it can be done early on. They are way more capable than we give them credit for. Just be careful that the entire room needs to be safe for him. So many questions but I really want to do this safely and informed. Thanks a bunch! Great post Pilar. My son is 9 weeks old and is sleeping on his floor bed still on his topponcino. I’m looking forward to when he is able to start moving and really exploring his room. One question I do have that I’m looking for advice on is how to baby proof a base board heater. There is one under his window and soon we are going to need to deal with it. Any advice would be greatly appreciated. That is wonderful you are using the floor bed from the beginning. As for the heater once your so will be mobile, it is matter of letting him know that this not something you want to touch. I would try to find a sort of curved screen to put in front. But I also really believe in trusting the child to know not to touch it. Thanks for a great article! I`m not familiar with the floor bed, but by the article I find the concept where interesting. However, I`m worried about the coldness that will arise in the floor-bed by the simple fact that it is placed directly on the floor. One of the reasons beds are elevated is that air can be flowing underneath the bed and “keep the bed warmer” then if placed on the ground. Thanks for your comment. Yes there are some low wooden frames that can also be used. I guess it also depends on the climate you live in. Hi Elisabeth, I found a trundler bed frame worked really well. It is very low to the ground, yet the air can still circulate underneath, and I have been using a thinner foam mattress on top of it too. Thank you Susan for your comment and suggestion! And thank YOU for this great work Jeanne-Marie! Jennifer, I am glad to hear you want to have an environment that promotes independence and freedom of movement for your child. As for the mosquito nets, I have seen some that are wider and can be tucked under the mattress on all sides except where your son can crawl out of bed. Hope that helps, you can also contact me directly if you need advice on setting up your new environment. Be well. Yes! Futon are very nice for the children. Thank you for sharing your positive experience with the floor bed. I never heard about a floor bed, sounds very logical. How do you combine a floor bed with nursing a young baby during the nights. A co-sleeper in the first weeks? And when the sleepings goes better a floor bed in the same room as the parents? Hope you can give me advice. Hi! I’m very much eager and interested in providing my 6 month daughter with an environment that best suits her needs. I exclusively breastfeed her. She feeds about 2-3 times in the night. She sleeps in her play pen right beside my bed. She just started crawling so we have lowered the playpen to the bottom. I’m not a big fan. I’d like to put her crib mattress on the floor next to our bed, but it’s not the safest environment since she will be able to crawl underneath my bed. Any suggestions on what to do? Is my only option to put her crib mattress on the floor in her bedroom? I’d really love to make set her bedroom as her place to be, sleep, wake, and play. But I worry it may be too cold in her room during the night and the noise of the highway will wake her. Brittney, Thank you for your inquiry. Would it be possible for you to place your mattress on the floor as well? This would be temporary until she can be in her own room. I have also sent you an email with more details. Hope it helps. Hi Debby, if you see my response to Alyssa’s question below, I think it might give you a good idea of what can be done. I moved Zach to his own bedroom after 1 month, but I have friends who have placed a floor bed on the floor of their room. The only caveats are: your room must be FULLY child-proofed; and you run the risk of your baby crawling to your bed when they become mobile, wanting to nurse at all hours of the night. In their own room, they realize that night is for sleeping, not nursing, and they develop healthier sleep patterns. Good luck! I understand the reasoning behind a floor bed, but I’m wondering where is the belief behind co-sleeping? I have practiced co-sleeping with all three of my babies, and each one has been a great and truly bonding experience. As someone from a foreign culture, I feel like the need to have whole rooms and separate beds from a child is largely an American idea. I applaud the idea of a floor bed because it is more economical and practical than many other traditionally “American” concepts on what is needed for an infant, but I still feel that much is missed in terms of having the little one close by. Perhaps my pov comes from my need for convenience in nursing throughout the night, but I still feel co-sleeping has created a bond between my children and I.
Alyssa, I kept Zachary with me for the first month, he slept on a floor bassinet right next to my bed (we have a small bed and we’re tall people, so bed-sharing was out of the question). This was convenient for nursing on cue, but it also helped him to establish proper sleep patterns due to the proximity to his parents. After a month, once he had established a good sleep pattern, I moved him to his own room, which is right next to ours. He did not react negatively at all; on the contrary, he started sleeping in longer spurts and by the age of 5 months he was sleeping through the night. I believe that newborns need to be with their parents, but once they get comfortable with the idea of sleep/wake patterns, it is in everyone’s best interest to each have their own space – this way parents can rekindle their intimacy and baby can develop his independence. Its also highly recommended to do what is best for you and your family. I have recently become aware of the option of a floor bed and love it! The problem is, my daughter is now 11 months and has been sleeping in a crib since birth. I would love to transition her to a floor bed, but am not sure how she would react since she has become accustomed to her crib. Any advice? Emily, my suggestions is to prepare your daughter with the change by talking about it and taking the crib apart together. The room should not change much, it really is taking the mattress out of the crib and placing it on the floor. Make it an eventful right of passage. She might discover her independence at first and come out of her room, it is critical to stay consistent and bring her back to her bed. Hope this helps! My understanding is that a non organic mattress should not not be placed directly on the floor, as it is a health hazard because the lack of air makes chemical vapors build up and escape through the top of the mattress, creating a health hazard for the person sleeping on it. Julie, thanks for bringing this up. Yes special care should be taken in choosing a mattress, whether put directly on the floor or not. There are also very low bed frames to help with the air flow. An organic cotton futon is actually ideal. You should also turn over the mattress every once in a while to air it out and for condensation. I am a Montessori teacher from Sweden with a son and a daughter of 17 and 14 years of age. I used a floorbed for them from the very beginning, and it worked incredibly well. I highly recommend it. The children liked to sleep in their own bed and, as everyone needs to sleep, so did they . I really felt that they got the freedom of movement, both of them started to walk early. I was at that time very inspired by Dr Montanaro’s book “Understanding the Human Being” It is a book I strongly recommend for anyone who is expecting a child. Brigitta, thank you for sharing your positive experience with the floor bed. Yes you are right I recommend “Understanding the Human Being” by Dr. Montanaro, to a lot of parents. It should be recommended reading for it is really all you have to know! We have a family bed made up of a queen and a twin futon both on the floor. Lots of room for everyone and no worries if the baby rolls off of it in the middle of the night (like he did two nights ago…). Thanks Athene, sounds like a great combination for your family. Doesn’t this go against everything we have learned about preventing SIDS? Jennifer, thank you for your concern and comment. Personally I would have to say, no not at all. The difference here is between placing a child in a restrictive container as oppose to letting them have the freedom of movement and independence needed for optimal development. I would advise that the room the floor bed is in, be totally child proofed and that nothing that could suffocate or get in the way of the child breathing properly be placed near their sleeping arrangement, this is true whether using a crib or a floor bed. Concerning SIDS there seems to be different theories and different advise given, whether the child should sleep on their side stomach or back. I have two children and within the 4 years of those births advice had already changed. The floor bed is for me one of the best aid to encourage independence, freedom of movement and the development of the visual sense from the very beginning. I do hope this answers your concerns. I am a mother of 5 girls. They all have a mattress on the floor. We did toddler beds for a while, but it didn’t work out. They are happier and sleep better with their mattresses on the floor. The older they get the more they move around. My oldest is 6 and she sleep walks. We find that there are less owies in the morning since we got rid of the beds! Wow! Katrina five girls congratulations! The floor beds for you certainly make more sense. They can all be independent and even walk around 🙂 I just makes so much more sense to let them have that freedom thank you for sharing. Yes you are right Katrina but I would also be careful not to confused the child. So that bedtime does not become playtime 🙂 Having separate areas for different activities helps children know what is expected of them. Thanks Vicki for sharing your experience. I do believe futons are the way to go especially for our children. Do share with all your parents! We did this with my daughter who is now 8 years old and it was wonderful! We hadn’t ready anything about it, it just made more sense to us. There was no sleep struggle and when she was about a year old remember about a week where she was thrilled to realize that she could move freely about if she so desired before falling asleep. We simply put up a gate at her room door and made sure she was safe in her room and she self soothed by playing and exploring before bed…like any adult would do! 🙂 Like I said though, it lasted for about a week and then bedtime went back to normal. Thanks for helping me go back in time! Wonderful memories of our floor bed! Great article, thanks for sharing. Jen, thank you so much for sharing your positive experience and memories of using a floor bed. I am glad you followed your instinct concerning where your child should sleep. It is so important as parents to remember that our instincts are often the best advise we can get. I am wondering what your thoughts are on the relationship between freedom and discipline and the floor bed (caveat – I am AMI trained in 3-6, not A to I). We had an unsuccessful experience with my son on the floor bed – in part due to the room not being conducive (wood floors and a small area rug – couldn’t afford to purchase large ones) and I wasn’t willing to let him “cry it out” on the hard floor, and in part b/c he was a colicky baby and only either slept propped on us, or semi-upright in his carseat until about 4 months. And also largely b/c I was just way too sleep deprived to handle it once he started crawling at 5 months and still woke up 4-5 times a night (he was on the floor bed from about 4 – 7 months). While traveling we happened to use a pack-n-play at a friends house and it was the most liberating experience I’d had since his birth. To me, it seemed so clear that the limits of the four walls of the “crib” where what he needed to be able to put himself to sleep. And he always slept up agains one of the walls of the crib, making me think that the physical boundary was a comfort to him, as opposed to the open expanse the floor bed affords. I think that the floor bed theory is beautiful and intuitive, but it is not without its challenges. Especially when other values intersect (i.e., comfort nursing/not letting your infant cry alone). It’s not at all my intention to be a downer on this thread, just wanted to share my struggles and thoughts. And I should add that reading the article gave me to boost I needed to transition my daughter (12 months) back to the floor bed last week! Emily, Thank you for sharing your experiences. It is true that the floor bed can be a challenge for some, you are not the first to have voiced this. I think it is really important to be consistent from the beginnig, even if the child is sleeping in a small basket to always place it on the floor bed so that they have a point of reference, knowing where sleep happens. 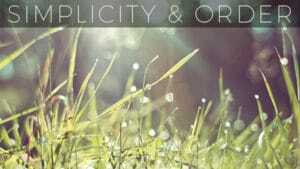 As for freedom and discipline, it is the freedom of movement and self-discipline, knowing that when one is tired to go where sleep happens, it is learned ealry on. It does not come alone thou for the parents also need to be consistent in helping them find their routine. Hope this helps. Hi Emily! 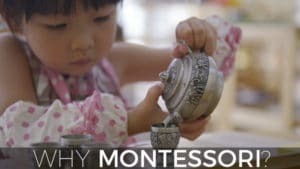 I want to add that Montessori is about following the child – YOUR child. If for some reason he needs boundaries when he sleeps, then by all means give them to him! You did the right thing by observing your baby’s needs and adapting the environment to satisfy them. That’s all a parent can do, always remembering that the decisions should be made for the benefit of the child, not the comfort or convenience of the parent. I hope your daughter enjoys her floor bed and your son gets some much-needed rest! Li Ling, it really depends on the mobility of your daughter. Can she get up and off a regular bed easily? As parents we have an important role of observation, so that we can determine the needs and challenges of our children. At one she is still small enough to be on a smaller mattress if you are lacking space. Hope this helps. Hello, I have a 2+9mo old and a 14 mo old that just started sharing a room, baby in the crib and toddler on the top of bunk beds. They are not sleeping well in the same room. I want to remove the crib and put baby on a floor bed, but my 2-year-old gets out of the bunk bed and climbs into the crib- every night! this wakes my baby up, and they scream (their for of talking…) back and forth for hours. I end up removing the baby to a pack-n-play in my room, every night. How am I to even attempt a floor bed with the baby?? Kara, sounds like quite a situation you have. I would definitely put your younger one on the floor bed. Boundaries need to be set with both of them, except only the older can understand. You might want to try placing them both on the floor for a while, until they get use to having their own space for sleep and rest. You need to find a routine you are comfortable with, which will eventually enable everyone in the house to get a good uninterrupted night sleep. Let us know how it goes. My oldest had a floor bed and it was great until about 9 months when she started staying awake and playing with her toys! We had 600 square feet so I couldn’t empty the room. I wished I could have figured that out because for the rest of the kids I just didn’t both. Kate, Thank you for sharing your experience with the floor bed. It is true that once the child starts being independently mobile it can be a real challenge. It is about being aware of the stages of development to properly prepare the environment for the child. Hi! I just want to let everyone know that Jeanne-Marie is on vacation and off the grid (lucky her!). She’ll be back soon and will answer your questions. Thanks! Thanks Pilar! Yes being truly off the grid feels completely rejuvenating. Enjoyed nature and my family was the most satisfying! I have never heard of a floor bed before and I am very interested. What kind of mattress can I buy and from where? Also, my son is 14 months and mobile. I am worried about ‘movement in the night’ and safety around this issue. How much child proofing do you need, and would you suggest a baby gate at their bedroom door or end of the hall or is this too confining as well? I’d like some direction on how to do this with my little moving boy. Amanda, so glad you are interested in trying out the floor bed for your son. The mattress should be as organic as possible I also suggest cotton futons. Depending on the size of your son he can probably use a crib size mattress for awhile. Otherwise a twin size will do the trick for years to come. Depending on where he has been sleeping until now, you need to allow for a time of transition. If he has been in a crib, do take it apart with him and make it a special event. As for the safety of the room, make sure there are no cords hanging from blinds or curtains, that electrical outlets are safe and that furniture is secured, in case he wants to start climbing on the bookshelves etc. A baby gate can be a good idea, depending on the layout and security of the rest of the house but not always necessary. His room should be set-up so that he has activities to explore safely. Take a look at my Pinterest for some ideas. Enjoy! Thanks so much for sharing your experience with the floor bed. I looked at your site, the product seems nice, I would love to see more pictures though and possibly a sample. Be well! I find the idea of a floor bed fascinating, but I have some reservations I hope you can help with. This babe will be the fourth, and will be sharing a room with an older sibling either way. If it is a girl, there will be no other room for a bed except for bunks, and our room is way to small for a twin matress to fit in. If it is a boy, he will be sharing with a 2 year old who I know will not let him sleep> My biggest concern of all, is older siblings “helping” and try to pick baby up at any point and injurying them. Any advice? Thank you for your comments. I understand your reservations. How old are your other children? For the first three years a toddler mattress can do the trick if there is an issue of space. I do believe to have the infant in the siblings rooms helps with any type of adjustment issue i.e. jealousy. Your younger ones will have to be guided as to what is the appropriate way of handling their new sibling. Did your other children have floor beds as well? Check out Bedstart.com for some ideas and if you have photos to submit. Thank you for your response! I have a 7, 5 , and 2.5 year old. My oldest two made the transition to a floor bed from a crib and we both loved it. So glad we can try the crib mattress! Thanks for this post! We have had our 1 yr old daughter in a floor bed since she was a few months old. It has worked great for us! I love being able to cuddle with her before bed and after she wakes. Now that she is mobile she will crawl out of bed if she doesn’t want to nap and lay next to the closed door and cry until I come for her. Any suggestions on how to encourage her to play in her room instead of feeling like she is trapped? If I’m in the room with her, she’ll play by herself but the minute I leave, she crawls after me to the closed door. Help! Joy, thank you for sharing your positive experience with the floor bed. My suggestion about her not choosing to play in room would either to leave the door open, so she does not feel “trapped”. That way when you observe she might really be ready to lay down you can bring her back to her room. She might even stay on her own. Hope this helps and do let us know how it goes. Be well. Fantastic post, one that I will be sharing with apprehensive family members! Thanks for sharing this. Quick question – my only hesitation has to do with the four sides of the mattress and SIDS…. because there are more surfaces of the mattress, wouldn’t it be easier for them to get stuck in a position? (I realize this isn’t a likely scenario!) I am interested in a small frame for the mattress (with rounded edges? ), but not a really high up one…..all of the frames I’ve seen seem really high! Do you know where I can get a 2 inch (or so) one? Or should I not be worried about this? Thanks! Rebecca, so glad you the information was useful. Yes there is a a small wooden frame that can be used. So far the one I located is at Michael Olaf http://michaelolaf.com/store/product48.html. I also have the dimensions if you are interested in having one built. Take a look at http://www.bedstart.com for some other ideas. Good luck and I am glad you are inspired to give this great opportunity to your child. Thanks, Jeanne-Marie! I appreciate it! I am 20 weeks pregnant with my first child and feeling so conflicted about whether or not to use a floor bed. Here are my 2 concerns: First- STORAGE-The nursery is a small carpeted room with no closet. I am thinking I could use some high shelves with hanger rods below for her clothes. We also have a tall bookshelf that I’d like to use by putting baskets on it so she can eventually access some of her clothes herself. Is it unsafe to use a tall bookshelf? What if we make sure it is secured to the wall? Second- DOORWAY- immediately outside of the nursery (on the 2nd floor) is the wooden staircase downstairs on one side and a wooden step up on the other side which leads to the hallway to our bedroom. I”m assuming this means we need at least one gate, at the top of the stairs. Do people put gates on the doors of the nursery when using a floor bed? Then you can’t shut the door, right? How can I ensure the baby is safe from the dangers beyond the door without using a crib? Heather, Congratulations on your pregnancy! I can totally understand your concerns. For one yes if you have a tall bookshelf it needs to be secured to the wall. Your baby might eventually want to explore climbing on it. As for the clothes, you might want to find a small “armoire” so that you can store your baby’s clothes in it. Leaving an open rod with clothes on it might be too tempting… Also, I would consider putting a gate either at the top of the stairs or on the nursery door. I do believe it is possible to find one that can be used along with the door. The idea of having a floor bed is that the entire room needs to be safe for future exploration. Let me know if you have further questions, I am always available for some consultation by phone or Skype. I do hope this helpful. Take care. this sounds very intriguing. we’ve used a family floor bed with my 16.5-month-old daughter since birth. it’s been mostly great except I’m growing weary of trying to keep her in bed at bedtime and naptime. it’s quite a mutually unpleasant battle now and it’s really not working for me at all. I’ve never used a schedule with her but a child-led, flexible routine has been helpful to us both during the past few months. it’s not that I want her to sleep at any given time. I just require some quiet time with (or even without) my husband at the end of the day. is it too late to implement the ” close the door and walk away” method? what if she just cries at the door instead of falling asleep? would we need to be open to the idea of her staying up until we go to bed? Jasmine, Thank you for your comment and question. There are three things we have very little if no control over out children and that is eating, toileting and sleeping. The things we do have control over is the environment we create for them, the routines we establish and the time we give to these situations. It sounds like a routine needs to be established so your daughter can be relaxed and quiet and asleep so you and your husband or you alone can enjoy the much needed quiet time. I do not believe in letting them cry it out. But it can be explained that it is her choice to be upset. It will take some time for you to establish this new routine but consistency and repetition will bring you success. Remember to only include in your routine what you are comfortable doing for a long time. I do hope this helps and good luck. My almost 10 month old has been in a crib to date in my bedroom and fed her to sleep (criminal in some peoples minds but it seemed natural). Now I’d like to prepare her for daycare and get her to sleep without assistance. I’m concerned that if she doesn’t learn this at home in a loving environment, she’ll struggle to sleep at daycare and wont be happy there. I’ve prepared her own bedroom in the montessori style, and there is a floor bed. Yesterday I tried to get her to nap in it on her own, she cried for an hour before eventually passing out. She wanted to be cuddled / fed to sleep. The afternoon nap was no better. How do I make the floor bed and independent sleeping as pain free as possible? Or is a painful transition uavoidable? Thank you for sharing your concerns. Going from sleeping in the same room with mom and being cuddle and fed to sleep to sleeping in another room would be a hard transition for anyone. You might want to try and transition her slowly, by explaining that this is now her place to sleep and staying with her for a little bit to reassure her. You will need to establish some new routines to compensate the feeding to sleep. I would recommend not letting her cry for so long though, maybe going back after 10-15 min and patting her back, reassuring her etc. Its going to take some patience and time but you are right in wanting to help her transition before going into a new environment. Sleep is one of three situations we have little control, we only have control over the environment we create, the routine we establish and the time we give to the situation. 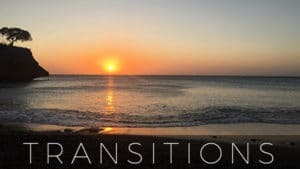 If you feel you need more support I would encourage you to seek the help of a sleep coach, they are very helpful for these types of transition. If you are in the San Diego area I do have recommendations. My 5 month old is happily sleeping on his floor bed. In all the photos I see online the babies are sleeping in just nightwear or under a loose blanket. It’s not warm enough here at night to sleep without a blanket and I worry to have a loose one for risk of suffocation. So my son is sleeping in a sleeping bag with a light blanket tucked in over him. It seems to work so far but is the sleeping bag going against montessori principles? I guess once he is crawling it will impede his movement to some degree. Opinions please! Rachel, Thanks for sharing your experience with the floor bed. I don’t think the sleeping bag is against any principles, it’s all about adapting to your time, place and climate, so you are doing what is necessary. I do believe that once he starts being more mobile it might get in his way. I would suggest dressing him with warm sleepwear and having a blanket well tucked in. If he is able to move well I don’t think there should be any issue. Be well. Do you worry about the risk of suffocation if the mattress shifts and the child’s head is trapped between the wall and the mattress? I think one of the reasons cribs are recommended (and need to be of good quality and with a properly fitted mattress) is to prevent this danger. Diana, Of course I would worry about such things, but unfortunately there are also many accidents with cribs. I make sure the mattress is well secure, safety is always first and I still recommend a floor bed over a crib for all the reasons mentioned in the article. I am just learning about the floor bed and Montessori bedroom approach and am very intriguied. I am also concerned. My 17 month old is nursed to sleep pretty much nightly, and then put in her crib. Sometimes she falls asleep in her crib with me rubbing her back. Is this possible in a floor bed? I am also wondering what type and size is appropriate for introducing the floor bed. Is it best to start by putting her crib mattress directly on the floor, or would moving our full-size guest bed (a firm Tempurpedic mattress with no box spring) into her room be safe? Nicole, Glad you are interested in knowing more about the floor bed. Nursing your daughter to sleep and rubbing her back is totally possible with the floor bed. You might want to start with the crib mattress directly on the floor preferably in the same area as the crib. Do explain what you are doing and maybe do the change with your daughter so that she is not surprised and understands it is for her benefit. As for the pictures I would avoid any distraction to relaxing in her sleeping area. Do put pictures down low for her to admire but maybe not right where she sleeps. Also, is it against Montessori principles to have the bed touching 2 walls, and a dresser turned side ways and secured to the wall as a 1/2 wall? I’d either secure photo frames to the back of it or paint a tree there so she would have something beautiful to look at. i never thought of this, but then after hearing about it just makes so much sense! Tina, It does make a lot of sense doesn’t it! I am expecting my first child, and would like to begin using a floor bed after initially using a bassinet. Our baby will eventually be cared for by my parents during the day, and they are planning on buying a crib for their house for naps. Would this be disruptive to the floor bed environment at home? Rebecca, congratulations on both the upcoming birth of your first child and wanting to use the floor bed. Children are incredibly resilient and I don’t think it would be too much of an issue just a bit confusing. Could your parents be convinced into getting a floor bed? YOu might want to look at my Pinterest board “Floor beds” or at the Bedstart.com website for some nice alternative. contact me directly if you would like to discuss further. Be well! New to the conversation here… please excuse me if this has already been addressed. My son is 6 months and is sleeping on a floor bed in our room. He has been on a floor bed for the last 3-4 months. However, now that he is crawling he doesn’t sleep well at all. He is constantly exploring during the night and/or falling of the bed or hitting the wall. Either way, he just isn’t sleeping well on the floor bed (and consequently, we aren’t either!). We don’t want to go to a crib, but we feel a little helpless and want some sleep ourselves and we think that at least the crib will keep him contained. Thoughts? Rocco, thanks for sharing your thoughts and concerns. It sounds like your son has discovered his mobility and therefore more freedom. I would not assume that he is not sleeping well due to the floor bed but more because he is going through a big developmental milestone, very common and often called wonder weeks. Be patient and he will find his way back to sound sleep on his floor bed. Let us know how it goes. Be well. I agree with all the benefits of floor sleeping for babies and have first hand experience with all three of my children. However, since I am more of an advocate of attachment parenting than of montessori, I prefer to have the baby sleep with the parents……so we ALL sleep on a king mattress on the floor! We get the best of all worlds – co-sleeping, easy nursing, safety, independence for everyone. I wouldn’t have it any other way. My 2 and 3 yr olds sleep on a twin mattress pushed up against our mattress, so it’s almost like a giant bed. Everyone is physically and emotionally safe, I don’t have to go far to comfort the toddlers if they wake in the night, it works very well. And yes, my children are all agile, early walkers (10 mth, 9 mth, 8 mth first steps unaided). Helen, Thank you for sharing your beautiful experience. It sounds like the floor bed has worked out well for the entire family. Hi, as soon as my son could crawl he wakes up before dawn and comes directly to our bedroom. He doesn’t play alone at all. How can I teach him to play in his room so we can get more sleep? I am curious about traveling with kids who are used to a floor bed. My 8 month old sleeps on a floor bed at home and has for a while. She is not yet mobile but I’m thinking she might start to be by the time we go out of town in a couple weeks. Any suggestions for traveling and staying in a hotel with a kid whose used to a floor bed? Thanks! Jessica, I would be incline to continue using a floor bed type of arrangement, whether traveling with a small pad that you can lay on the floor or some blankets. The important thing is to have whatever she is used to falling a sleep with i.e blanket or pillow. Otherwise you can use a temporary pack and play if you feel the rooms are not safe enough for her. I have also seen shallow blow-up beds that might be good when traveling. Hope this helps, happy and safe travels. Derya,Thanks for reading and visiting. For the mattress directly on the floor, if it is on carpet I might want to put a hypoallergenic sheet underneath and around it. Otherwise I would just make sure it is dusted regularly. I do not see any issue. As for the cupboard there is no problem for it to stay in the room, just make sure it is well secured to the wall. When your baby starts wanting to pull up, it can be a concern if it is not well secured. Hope this helps, lets us know how it goes. Hi, we have a 12 month old who currently sleeps in a crib. She is held and fed / rocked to sleep then placed in the crib. She’s *super* energetic, and even if we’re in the same room, she can wake and be standing at the edge of the crib (rattling the bars) before we get to her. She currently wakes 2-3 times a night. I’ve seen other articles suggest that floor beds may not be right for energetic kids like this – what do you think? Mike, thank you for your interest in using the floor bed for your daughter. I believe that if the room is safe for exploration it should not be an issue for an energetic child, on the contrary. She will learn to self-regulate as she learns she can get out explore and return to her bed. I would suggest altering the bedtime routine so that she learns to relax and fall a sleep on her own, this will help with the nighttime waking as well. Let us know how it goes. Hi! We have been trying to follow closely the Montessori approach to creating an infant environment in the home, so we also used a floor mattress. The A-to-I trainer said, as you did, that our baby would fall off rarely, discovering the boundaries and adjusting. However, our actual experience was that he would wiggle off at least once every time we put him down to nap or for the night. I didn’t feel like he was suffering any harm in the roll off, but I finally replaced the crib mattress with an exercise pad (1.5″ height) after he wiggled off, got stuck face-down half on and half off of the mattress, with his back arched at an odd angle. I saw it on the monitor, and when I picked him up, he took a big breath of air, as if he had been unable to breathe. We’ve opted not to go back to the crib mattress until he is solidly crawling, and able to get himself out of such positions. Any suggestions? What did we do wrong? Angie, Thank you for sharing your experience. I assure you, you have done nothing wrong but following your instinct and your child’s needs. Every child is different some move a lot while sleeping others don’t. I believe the experience for him is the same whether on a crib mattress or exercise pad. The idea is to give him the freedom to move and a good visual sense of his environment. Do keep us posted as to how he does. Be well. Marisa, thank you for sharing your floor bed experience and beautiful find. We have a crib mattress to use, I have two questions as this is a new concept for me, and our daughter is 9 months. First, if the mattress is in the corner, is there any issues w baby getting stuck between the mattress and the wall? Second, ours has only ever been able to sleep in my arms or in a rock n play… Any suggestions to moving her to a floor bed which is flat, and open? I should add she is crawling and getting around pretty well now. Jenna, For some reason I am just now seeing your comment. What did you end up doing and how is it going? Hi! My husband and I live in one small room, with a larger house nearby for kitchen/bathroom facilities. We’re expecting our first bub in May. How can we provide a Montessori style space that is safe and calm along with our own collections of items/furniture? We have nowhere to remove it all to, and the room simply isn’t big enough for a mattress on the floor. We want to provide this space so badly but we don’t know how! Kylie, Thanks for contacting me. Due to the physical circumstance it might be a good idea to look at what is really needed to stay in the room you sleep in. Then I would simply put a crib size mattress out of the way for your little one. It is hard for me to imagine without seeing. We could try to Skype if that is possible for you. Be well. I love your website! Thanks for such a great article. My baby recently transitioned to a floor bed from a Moses basket which was always placed on the floor – at first besides my bed and then for 3 weeks in her room before placing her directly on the low bed mattress. I have a question concerning sleeping sacks… The pediatrician recommends using one until 12 months of age!! Somehow This doesn’t seem to match the whole purpose of the floor bed, which is to encourage independence and movement. However, is it safe to start using a blanket at night at 3 1/2 months? I love your website! Thanks for this great article. We have a 15 month old and are just now getting onboard with a floorbed. Unfortunately we are in a transition phase while my husband finishes his internship in another state. We’ll be here for another 6 weeks. Should we hold off on transitioning to a floor bed until we’re in a permanent location? We may end up temporarily at my in-law’s and there’s no room condusive of a floorbed. It’s not childproof and he’ll be sharing with us. I don’t want to go backwards to a pac n’play or crib. Also, how do people go on vacation? Do they take their floorbeds and set them up in a hotel? He can’t sleep on a hotel bed because he moves a lot in his sleep, he’d fall off. We usually use a pac n’ play. Tia, What is he transitioning from? At your in-laws can you put your mattress on the floor or just take out what is not safe from your room. If you are sharing a room it is most likely you will hear if he starts wondering which is an added benefit to safety. For travel if you can have a small futon pad to place on the floor. In hotels you can also ask for an extra bed and use only the mattress on the floor. Happy travels! Hi, we are new to Montessori and to the floor bed. Our daughter slept in our room in a bassinet until 5 months and then mainly co slept with little time in a crib or pack in play. I didn’t like the idea of the crib and so we did a lot of research and found the floor bed. We are on week two and love it. She sleeps a lot better, wakes a lot better and enjoys her environment more. But I have a few questions that I cant seem to find answers to. First she is almost 13 months, is there a transition period that I would change her from a floor bed to a regular bed? Also she was really good about staying on the bed the first week. This week almost once a night she will be on the floor or half on the bed. She isn’t hurting herself since it is set up properly, but it is cold tile floor and I am worried about the colder months coming. I am also wondering why she did so well and now she is falling off. She has been more restless in her sleep this week, possibly teething, but I thought that once she gauged her area she would stay on the bed. Also wasn’t sure if maybe I should have her on a twin instead of a crib mattress if that would help. I would love to be directed to a recourse for how to set up a Montessori environment properly for the odd space we live in. Any direction is greatly appreciated. Thank you so much for the great article! Caitlin, So glad your daughter is enjoying her new set-up. The floor bed does make a lot of sense especially when we want to give our children the freedom.. At this point a crib mattress is fine and should be for another year or two. The transition to a normal bed will happen when you feel their is no longer a risk of rolling off and she has good gross motor skills. Their is really no need to get a twin size mattress, unless you want to lie down with her. As for being restless and rolling off her bed is totally normal behavior and she will soon learn that staying on her mattress is much more comfortable for a good night sleep. 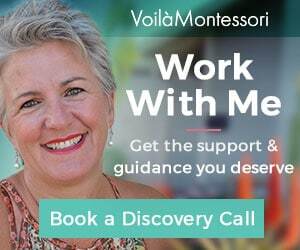 I’m here to help you set up a Montessori environment in any place odd or not. Go ahead and book a free call with me! Use the “Let’s Talk” tab to find a convenient time for us to speak. 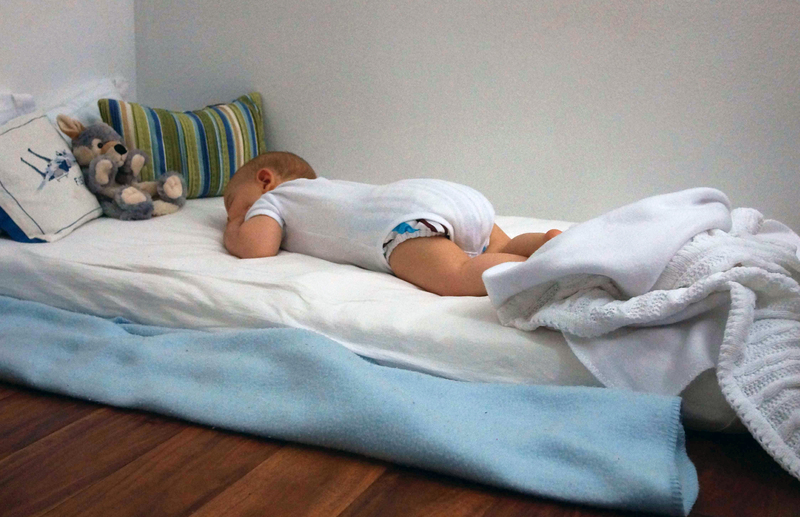 Thanks for sharing your personal experience with your child’s floor bed! Hello! I am very interested in transitioning my 2nd daughter (13 months) to a floor bed. She goes down in her crib jist fine for bedtime, but screams bloody murder when I try to put her in there for naps. So for the last 2 months we’ve been napping her in the car parked by the large bay window and (proper clothing, ventilation, etc) and now I’m afraid she won’t ever sleep inside again lol. Her older sister colept and then slept on a floor bed (just intuitively! I didn’t know it was a real thing lol), but my baby girl has a very difficult time settling with me. I’m wondering if you have any suggestions for getting her used to the idea? Should I attempt to comfort her and stay with her in her room until she settles and sleeps or leave her to independent free play when she’s sleepy and hope she gets quiET and rests? I’m nervous she won’t like being alone in her room even if she’s very tired, but that if I’m with her she won’t actually sleep. Would you shut the door or use a baby gate? We have a woodstove down the hall so I wouldn’t want to risk her coming out of her room unsupervised. Thank you! Jolynn, Yes I would encourage creating a safe floor bed for her, exactly where her crib has been. Do this with her explaining that this is for her to be able to sleep at night and at nap time. For naps have a very simple routine, right after lunch is usually the best time. Can the room be dimmed for nap? You can either close the door or have a baby gate that is up to you but I would keep it consistent with what you have been doing at night. What is important here is having a very simple relaxing routine for nap time and trusting that she will eventually get it, might take a few days to change from car sleeping to floor bed. Let us know how it goes. I use a floor bed for my 10 month old. He has been in it since about 5 months. When he was around 7 months we did gradual withdrawl and he started sleeping amazingly. I would put him in bed, leave the room and he would drift off to sleep in chatting a bit. He would do this day and night and it was lovely to see. Now he is crawling, the minute I put him down and leave he climbs out and cries and bangs on the door. He wont go down for a nap in the day (he still needs 2) and if he doesnt fall asleep having his milk at night he climbs out of bed and onto me (i now have to lie down on the floor next to him) for at least half an hour before he lies down and goes to sleep. If i leave he cries and gets up and I have to go in (I wont do CIO). It’s a nightmare! I am so tempted to give up and use a cot (although if he stood up and banged on the cot bars I wouldnt leave him crying, I’d go back in so I am not sure why I think that would work). I really want to floor bed to work. When will it get easier?! Should I persevers and keep leaving the room and going back in and hope that over time he just gets used to it? Sarah, This is unfortunate but sounds like a sleep regression that he will soon grown out of. I would continue to be consistent to help him find his healthy routine again. I often suggest to parents to create a personal sleep book you can read to him at night, reminding him of what is expected. Let us know how it goes. You are also welcome to book a time to talk more about it. Hi! Thank you for the awesome article!! I am 6 months pregnant with my first baby and am fascinated by the Montessori philosophy – Everything makes perfect sense to me! I do have a question about the floor bed sleeping arrangement… I will not have an extra room for her for at least the first year, and she will need to be in our bedroom 🙁 I want to encourage her to be independent but our place is just too small for her to have her own space. Can I still use the floor bed in our bedroom? Juliana, yes of course you can have the floor bed in your own bedroom. You can use a crib size mattress which will take up less space. Just be careful that the entire room is safe for your child once she starts crawling. Congratulations! Floor bed is very comfortable if the parent has good knowledge about size crib mattress.This article will be helpful for taking real understanding about the crib size. Very informative and useful content.I got some important point.Thanks for sharing this valuable post. Odho, Glad you enjoyed the article and found it informative. Let me know if you have any questions. This concept can really be done with any size mattress not only crib size. Hi! Thank you for this article. My son is 3.5 months old and soon he will be growing out of his bassinet. He has been sleeping in his own room since 4 weeks old and he takes naps on our bed and on the guest bed. I would like to avoid getting a crib and am thinking a trundle bed is the way to go. What do you recommend for bedding? Just a flat sheet and a small blanket to cover him? I’ve also read about using pool noodles under the flat sheet for protection-what are your thoughts on that? Thank you in advance! Renee, Your son sounds like he is definitely ready to have his own floor bed. You might want to go with just the mattress (that will fit the trundle) at first and yes just a fitted bed sheet is perfect. Pool noodles are used under the fitted sheet to have a little bit of a barrier if he is rolling off (not always necessary). As a oppose to a blanket you might want to use a sleep sack, then there is no risk of it ending on his face. Hope this helps, let me know if you have any other questions. I am concerned with a putting a child on the floor because of the cold winter months. We have a heater in his room that we turn on each night because his room is around 65 degrees without it. Also, I don’t think having a heater in his room would be childproof with his bed on the floor. Do you put up a baby gate to his door? If we didn’t, then he would be able to go into all the bedrooms and living rooms, which aren’t completely childproof. He is 19 months old and I would love to try this in the future. Not sure how to make it work for sure. Hello Ashley, thank you for your comment and question. Your concern is a valid one, is there any way you can baby proof the heater? Possibly having a baby gate around it. There are also some heaters that are meant to be safer and not hurt if touched. If you do not want your baby to wonder in the entire home I would highly recommend a baby gate, otherwise, if you are ok with closing the door you can do that as well. The aim is to make an environment safe for exploration. Thanks for the comprehensive blog post. I did the Montessori floor bed for my first son at age 6 months. There were challenges at times, but eventually he got the routine and things have been working so well for us. He never fights bedtime and sleeps and plays independently. There’s a great facebook group for doing and supporting the Montessori sleep approach (floor bed, wall mirror, open-concept nursery, etc.) if anyone is interested. They have great tips and support on how to introduce Montesssori from day 1. Yan, Thank you for sharing your experience with the floor bed. Isn’t amazing how they figure it out if w just give them the time and space to do so. I read through each and every comment, many of them addressing personal concerns and question I had in regards to the floor bed. This is what I had intended to do from the beginning, but then my husband’s sister moved into the room that I had initially set up as the baby’s nursery (with our old full size mattress on the ground). We’ve been co-sleeping so far (he is almost 8 months), but am again exploring the idea so that perhaps we’ll each get a little more sleep! I’m looking into organic twin size mattresses for the longevity (vs. temp crib size), but we also have the baseboard heaters, can you tell me what you might recommend for baby proofing those come winter? I would be extremely grateful for any advice. Thanks so much! Now that he is older you might want to look into putting the mattress in a low frame< I am pretty sure that would take care of the proofing for the winter https://sprout-kids.com/products/low-montessori-floor-bed-for-toddlers?ref=jeannemariepaynel. Otherwise, it’s making sure he can not fall onto the heaters and helping him be aware that they should not be touched (played with). Hi, excellent thread! A few questions – can I use a firm twin mattress right from the get go and avoid the crib/toddler size mattress? Also, do you recommend the floor mattress be placed in the middle of the room and not against a wall or is this not a big concern? Finally, regarding using a bed frame such as slats/wooden box like the one pictured above at sprout kids website, is it ok to use a bed frame from the get go, or start with just mattress on floor, and then add the bed frame later? Thanks so much in advance! Hi Brie, thanks for questions. Yes, of course, you can start with a twin size from the start. I actually prefer it if you have space then you can comfortably lie down with your baby when need be 😉 I have noticed that twin mattresses seem to be a bit higher off the ground. Personally, I prefer the bed to be placed in the opposite side of the door, so the child can see who is coming in and prefer that it be in a corner. Though some people might not like that so a very personal choice. What is most important is your baby be safe throughout the night and whenever they are sleeping alone. I like the newborn bed frame as it gives the child a natural barrier, but again very personal and I would be careful they are not too high off the ground and can get in and out of their bed on their own. Let me know if you have any other questions about the floorbed. Can anyone recommend a low profile organic/ non toxic mattress that will work as a floor bed? So happy to see you are looking into setting a floor bed. At this point, I do not have any specific recommendations for a good organic mattress. First, you will have to decide on the size you want to start with and go from there. Let us know what you find.